Sustain Design Studio recently unveiled their latest prefab model, the Solo 40, a smart and efficient modular home that packs a lot into just 480 sq ft. Sustain Design Studio is the brainchild of Candian firm Altius Architecture and is working hard to deliver no hassle homes that are energy efficient and sustainable. 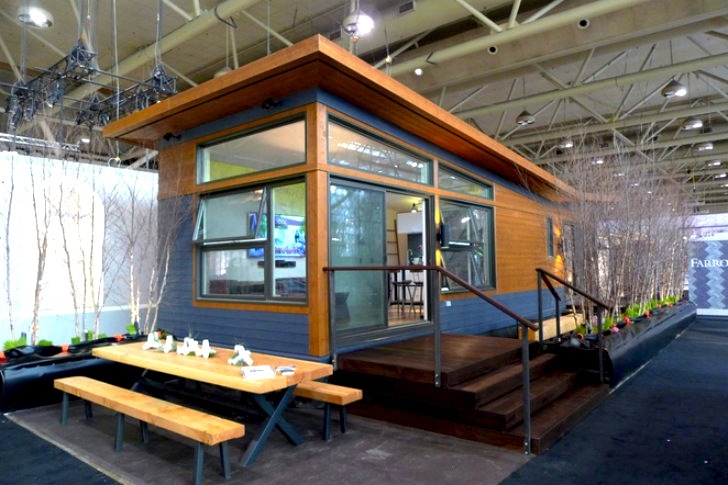 The Solo 40 is one of the many prefab designs in Sustain's miniHome line, which are all about functionality and sustainability in a contemporary design for reasonable prices. The Solo 40 recently debuted at Toronto's Interior Design Show in January. 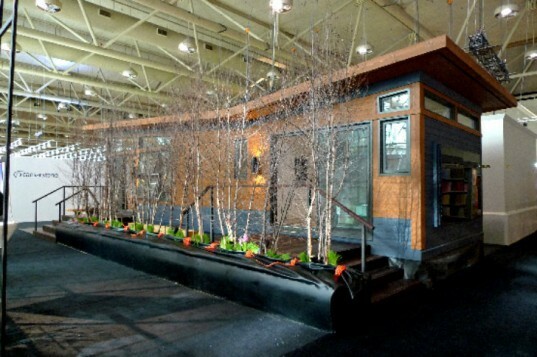 Sustain Design Studio became known for their TRIO prefab, a butterfly-roofed micro home that had us begging for more. So they gave us more with a whole line of prefab modules that can be linked together or kept independent. Perfect for accessory dwelling units, vacation homes, cabins, studios, office or even micro homes, Sustain’s miniHome line makes it easy to get a great small home. The Solo 40 is a 40 ft long and 15 ft wide home with a bedroom, bathroom and a open floor plan kitchen and living area. Windows are placed on all four sides to take in one’s surroundings while providing plenty of natural lighting with the help of clerestory windows. The butterfly roof makes a dramatic statement and larger overhangs help protect and shield the tiny home. As with all Sustain homes, the Solo 40 comes with a tight, energy efficient envelope, is built with renewable and non-toxic materials and finishes, utilizes passive ventilation for cooling and fresh air, and features energy and water efficient systems. The homes can be wired for solar, topped with a green roof and can include composting toilets and greywater filtration for off-grid applications. Sustain Design Studios builds their prefab homes in Ontario, Canada and is delivering the Solo 40 for C$ 93,600, or $195 per sq ft. Sustain Design Studio was first known for their TRIO prefab, a butterfly-roofed micro home that had us begging for more. Perfect for accessory dwelling units, vacation homes, cabins, studios, office or even micro homes, Sustain's miniHome line makes it easy to get a great small home. The Solo 40 is a 40 ft long and 15 ft wide home with a bedroom, bathroom and a open floor plan kitchen and living area. Windows are placed on all four sides to take in one's surroundings while providing plenty of natural lighting with the help of clerestory windows. As with all Sustain homes, the Solo 40 comes with a tight, energy efficient envelope, is built with renewable and non-toxic materials and finishes, utilizes passive ventilation for cooling and fresh air, and features energy and water efficient systems. The homes can be wired for solar, topped with a green roof and can include composting toilets and greywater filtration for off-grid applications. The Solo 40 can be used independently or grouped with other miniHome models. The butterfly roof makes a dramatic statement and larger overhangs help protect and shield the tiny home.